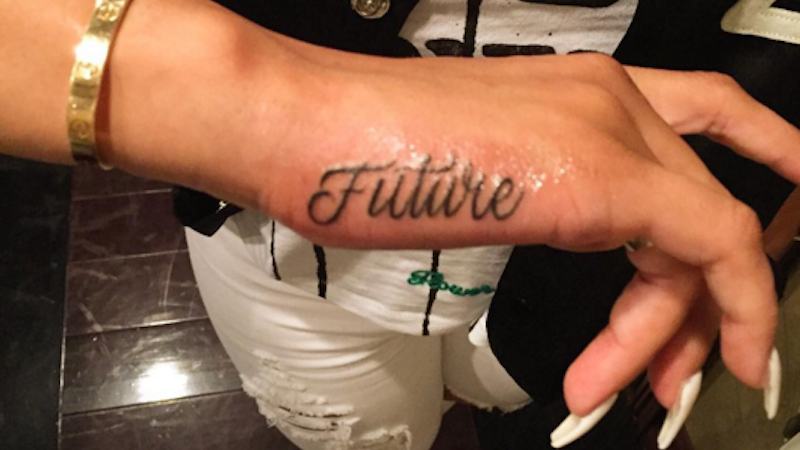 What Is Going On With Blac Chyna's New Tattoo? Blac Chyna has had an eventful year or so. Tyga, the idiot father of her child, left her to be with another another child—Kylie Jenner. That poor decision spurred a back and forth social media war in which we saw no winners. Recently, however, things seem to be going pretty well for Blac Chyna. She has a very nice new car, she’s almost at her ideal weight and she’s still friends with Amber Rose, which looks like a good time. She is also, as reported by TMZ on October 3rd, dating the rapper Future. I’m using the term “dating” rather loosely here because all we really know is that they’ve been seen together at a club and they later left that club together. That was really the only evidence of their relationship—neither posts about the other on their social media accounts—until this bomb of an Instagram post from Blac Chyna on Sunday. I mean, OK, I think it’s pretty clear what this means but also, what? As far as we know, they’ve only been together in some way for what? A month? Maybe two if they were keeping it quiet? Are Ciara—Future’s ex-fiancé and the mother of one of his four children—and Blac Chyna friends? Does she know about this? Did Amber Rose know about this and why didn’t she stop it from happening? Is this new tattoo maybe just an allusion to the great journey that is the unlived life ahead of us? Her caption: “Thought it was a drought,” with a purple devil emoji thing makes no pointed reference to Future and not a lot of sense to me. Perhaps Blac Chyna was suffering through a drought in the love department and now showers are a fallin’? I need some answers. Perhaps you don’t care about any of these people but we should ALL care about a young woman branding herself with the name of a man she’s been dating for a month. Blac Chyna, girl, talk to me. What the hell is this?